This BioProvince (as defined by Armen Takhtajan) comprises most of Szechwan (west of the Szechwan Basin) including the Szechwan Alps and the Yunnan Plateau together with mountains bordering northeastern Burma, northern Laos and northwest Tonkin. The region is situated at the meeting place of the eastern Asia monsoon, the climatic influence of the Tibetan plateau and the tropical monsoon of southern Asia. Consequently it experiences a range of climatic conditions. Geologically the area is very diverse with marine clastic rocks of Cambrian-Silurian origin, shales, limestones and red sandstone of Devonian-Carboniferous origin, carbonate rocks of Carboniferous-Permian origin, continental clastic and limestone rocks of Triassic-Jurassic origin and lacustrine deposits of Pliocene origin. In Shilin (Yunnan) a magnificent karst landscape has developed including spectacular ‘stone forests’ with stone columns reaching 30 m in height, and terrains described as ‘stone teeth fields’. The flora is exceptionally rich with several endemic genera including Antiotrema, Berneuxia, Chaerophyllopsis, Criagia, Delavaya, Dickinsia, Diplazoptilon, Faberia, Formania, Haplosphaera, Harrysmithia, Holocheila, Nouelia, Paralamium, Rhoiptelea, Sinolimprichtia, Sinomerrillia, Tengia and Tirpitzia, and a multitude of endemic species. Yunnan in particular with its complicated geographic environment and diverse ecosystems has a very rich biota with some 18,000 plant species (over 50% of China’s total). 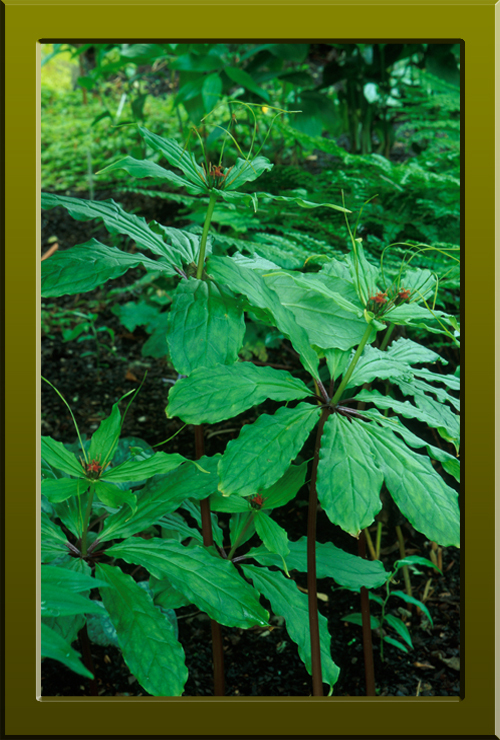 Paris yunnanensis (Melanthiaceae) a type of herb paris native to the broad leaved, coniferous and bamboo forests of Yunnan (Copyright © 2010 Peter Martin Rhind).